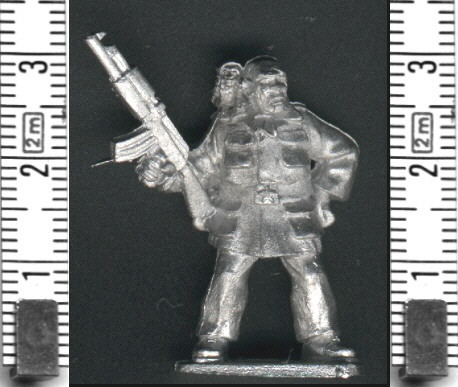 A guest article by Rob W.
The Assault Group (TAG) have established themselves as providers of characterful and (in at least one case) controversial 28mm Moderns. Pack DRA-011 (African Militia 2) is part of TAG’s second Dirtiest Africa range, a companion to their rough and ready Somali streetfighters. As the pack subtitle suggests, the second set form a relatively organised and well armed African Militia suitable for urban and rural encounters. This pack contains four figures varying between 29-31mm in height and mounted on integral stub bases. Mouldlines are generally slight, requiring only a little filing, but the right shoulder and head of the lead figure (see below) needed extra work. Flash is minimal and restricted to the bases and weapons. Given that most gamers remount their figures the odd shaped bases aren’t a problem, especially as TAG have made them thin and level, but’ll you need four spares of whatever you’re using. 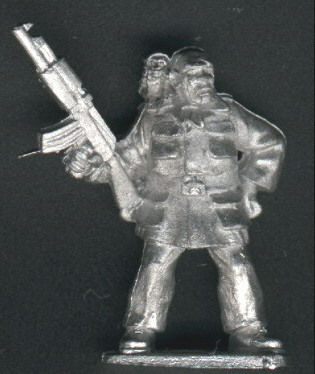 The pack’s main figure is an impressive commander, AK-47 resting on one hip, hand on the other, safari suit smooth and intact, monkey on shoulder. Yes, you can tell this guy’s in charge because he permits a little simian to nestle up to his bald head. He’s also big, determined and scarred across one eye, easily resembling the lead baddy from James Bond, a 1970’s action film or a commando comic. The other three are equally stocky men, also armed with AK-47s, although their clothing is less formal: trousers, a floppy hat and mismatched uniform. Poses are best described as ‘on-guard’ (left), ‘looking’ (middle) and reacting (right)’. Some gamers have criticised the well-built nature of these figures, comparing them to the underfed militamen who frequent our news. In this pack the size isn’t a problem: you have one well dressed African Warlord who you’d expect to be equally well-fed and men who could easily be his ‘bodyguard’, chosen and fed to keep them big and strong (more body, more to catch a bullet.) The sculpting might look simple for anyone used to miles of Napoleonic braid or TAG’s US troops, but militiamen have never been known for their elaborate preparation and the detail is both present and cleanly cast. In addition, these guys ooze character…even if that character is slightly disorganised and fast on the trigger.